produce GPR images of the subsurface. 2-D and 3-D cross-sections and maps are created by post processing the ground penetrating radar results. Here you can find ground penetrating radar services or surveys for geophysicists, engineers, geologists, military, and underground utility locators that are often used to map geology, mining, map fracture and fault systems, detect voids, locate utilities, scan concrete and pavement, locate underground storage tanks UST, find graves, archaeological investigations, map contamination, determine ice thickness, forensic investigations, agriculture, finding drain tiles, forestry, military investigations, and security applications. Many of these applications also fall into the category of engineering geophysics. A wide range of equipment can be rented from K. D. Jones Instruments. are designed with a variety of antenna frequencies and configurations. While there are differences of opinions and values often overlap, GPR antennas can be grouped into low, medium, and high frequencies. Lower frequency antennas (25, 50, and 100 MHz) are often used for mapping geology, mapping contamination or water, surveying archaeological sites, mapping ice, and characterizing deeper areas of concern. Mid-range antennas (100, 200, 250, and 500 MHz) offer better resolution, at the expensive of loosing greater depths of penetration. This group of ground penetrating radar antennas is often used to locate underground utilities, map structure within rock, locate buried metal, find drain tiles, map graves, or image massive concrete. More often concrete is imaged by a concrete scanner using a high frequency GPR antenna, approximately 1000 MHz. The higher frequency antenna often provides great detail for imaging post tension cables, rebar, utilities, voids, wire mesh, and engineered bolts placed in the concrete. However, a 1000 MHz GPR antenna has a difficult time penetrating much beyond the bottom of a concrete slab, if placed over soil. If the soil is a clean dry sand or gravel, one may be able to scan or image below the bottom of the concrete. Be aware that GPR will not penetrate through metal and has a difficult time penetrating through most water and clay rich environments. With the exception of ice, most water and clay rich soils are electrically conductive. Electrically conductive materials greatly reduce GPR capabilities. In comparison, wood, plastic, asphalt, and rock are not typically conductive and may yield desirable GPR results. In many geological settings, clients should be aware that an area can not be cleared of any obstacles. GPR is not a crystal ball. If a target of concern is not observed in a GPR record one can not conclude, for sure, that there isn’t an obstacle at depth. One can increase their confidence with intimate knowledge the site and with testing how the configured GPR instrument responds at the site to a known target at a known depth. For help, fill out PenetratingRadar.Com’s form. You can also go to the bottom of this page and leave a comment for someone to help you find an answer about ground penetrating radar. We will respond. What will be the penetration depth by 15 MHz Antenna. Your question implies that the depth of penetration for ground penetrating radar is dependent on frequency. That is only partially true. For all practical purposes, if you are over saltwater you may not get any deeper than if you used a 500 MHz or 1000 MHz antenna. If you are over granite, ice, or air, you may be looking at 100’s of feet. Unless you are looking for boundary layers, what ever you are trying to characterize better be big. we need to test seismic shot hole drill sites for caverns up to 60\’ deep in North Dakota. We do not need cross sections or maps, only where we can drill and not drill shot holes. Ground penetrating radar has limited depth of penetration. How thick is the soil? What type of soil? How large of a void are you concerned about? What is the terrain like? I think you might be disappointed using GPR. I am guessing that the soils are too thick and the voids are too small to detect at those depths. Geophysical instruments are designed to assist with locating or detecting features below the surface. There is not any one geophysical instrument that is best or the worst. Ground penetrating radar instruments, like Sensors & Software pulseEKKO or Noggin SmartCart system, offers a variety of antennas that are usually chosen based on what you are looking for, how deep it is buried, and what type of soil conditions you have. GPR provides some of the greatest resolution and detail but it can be difficult to use in rough terrain or other adverse conditions. If the treasure you are searching for is constructed with a lot of iron, a magnetometer is a great way of covering a large area quickly. If the treasure is buried in a vault or some kind of pit that contrasts with the surrounding area, electromagnetic terrain conductivity meters like Geonics EM-38 or EM31 and electrical resistivity surveys using an AGI SuperSting or Geometrics OhmMapper often yields desirable results. These non GPR instruments can not provide the detail that a 100 MHz, 200 MHz, 250 MHz, 500 MHz, or 1000 MHz GPR antenna can provide but they provide a cost effective alternative. Ground penetrating radar has been known to locate all of these features. However, it is strongly dependent on site conditions. What can you tell me about the site? Hello: I am interested in using a gpr to use in a very broad sense. I work for an environmental company and we like to use the gpr as a final safety measure to clear utilities from a proposed soil boring or monitor well locations. Locations can be highly variable with concrete, metal, clay, sand, etc. This job they not only want to clear the utilities around the proposed boring locations but als locate a septic/leach bed field in clayey soils. We have hired these kind of jobs out in the past but are considering renting and having it done by our field technicians. Is there a model this versatile, compact, and easy to use that a field technician can figure out? Ground penetrating radar equipment manufacture by Sensors & Software provides a wide range of antenna frequencies. If you are trying to image rebar or pipe in concrete you may want to try a 1000 MHz Conquest or Noggin system. With more ideal site conditions, like dry sand, a Noggin 500 MHz system will provide some of the highest resolution but may have less depth of penetration then a lower frequency 100, 200, or 250 MHz antenna. Clay, metal, and water are some materials that will limit depth of penetration. If you decide to try GPR in more conductive soils you want to consider a 200 or 250 MH SmartCart system. Ground penetrating radar with a 1000 MHz antenna is often used to image concrete slabs used for vehicles. As long as there isn’t an excessive amount of rebar or other metal covering the posttension cables, GPR often responds well to the metal cables. 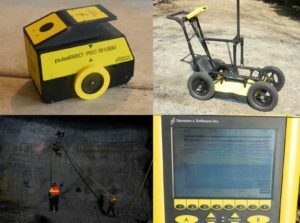 Because of the importance of locating the post-tension cables, it may be best to do a ground penetrating radar survey, not to clear a location but, to locate the post-tension cables in the vicinity of the core holes. This is a subtle difference and I think it increases the level of confidence that you are not going to penetrate a cable. How large of an area? It would seem to be a good idea to do a large enough concrete scanning ground penetrating radar survey to locate one or more of the post-tension cables and large enough to be able to track the cables through any potentially congested areas. All of this increases the level of confidence. Using GPR to image 55 gallon drums that are buried in sand is fairly good application. How deep do you expect the drums to be buried? What is the terrain like? The drums are just below the surface to 5 or 10 feet. The area is a gravel parking lot. GPR is likely one of a couple of good geophysical methods to use. A Geonics EM-31, Geonics EM-61, or a magnetometer will also respond well to near surface buried metal. Assuming you do not have near surface water, I would expect you would have fairly good success with Sensors & Software Noggin 250 MHz SmartCart system. Also, the pulseEKKO Pro would likely work well and comes with 50, 100, or 200 MHz antennas. With easy access, some of the best and most graphic results are generated from GPR data collected along parallel and perpendicular closely spaced lines, which for a grid pattern. The data is post processed using EKKOMapper and it creates plan view representations of the GPR results. It is often much easier to interpret the GPR results in plan view than it is in cross-section. Geophysically, success with ground penetrating radar GPR is dependent on the soil conductivities, depth of burial, electrical contrast, and the diameter of the pipe. Will the pipe be full of water? Also, what type of terrain are you in? The terrain can make a difference with the configuration used with which GPR rental equipment you use. What do you know about the soils? What type of facilities are you trying to map? Is the pipe non-metallic? Pipes are full of water. We are in (blank). For the most part, soil is sandy clay. Do you know if anyone else has used GPR in the past for what you are doing at the Fort. This is the best way to find out if it works at your site. No sir. I don’t believe anyone has before. I have spoken with a few people and they stated they know they can find the water main. They were not sure about the service lines. I would like to at least rent a unit and if nothing else test it out. Looking at your response it appears you want to use geophysical instruments to find any size utility and tile down to 4 ft. While GPR is an excellent tool, it isn’t a crystal ball. I need to know more about the soils you are in and the diameter of the utilities vs. the depth of burial before I can offer some ideas. Can we locate these PVC pipes with GPR? Our soil is good for about a foot and then becomes a clay mixture, how does this effect GPR? Can GPR read through asphalt and concrete? We will be able to map fields with this unit (ie GPS)? Can anybody learn how to use it or is it complicated? What is the smallest/minimum size of an object that GPR can locate? With good site conditions and large enough diameter targets to detect, ground penetrating radar can be used to locate PVC in soils, under concrete, and beneath asphalt; however, metal reinforcing material in the concrete and clay soils can complicate matters. Smaller diameter metal utilities are often more easily located than dry or empty PVC. However, a fluid filled PVC pipe in dry sand may be easier to locate than a PVC pipe with no conductive fluid inside it. GPR systems like Sensors & Software pulseEkko Pro system or Noggin SmartCart integrate GPS into recorded data. Many people who have no prior experience with GPR equipment have taught themselves how to use GPR. Depending on your drive, life experience, and level of education, teaching yourself may or may not be a good idea. The easiest place to teach yourself is in an area where you know what is buried. Detecting and mapping graves with ground penetrating radar is a very difficult task. In my opinion, no one geophysical method is the answer. However, if you have a site where ground penetrating radar works well, the resolution and maps are some of the best. This explains why GPR is often a preferred method. Electromagnetic methods, electrical resistivity methods, and magnetic methods often preform very well. Geophysicists, engineers, and other scientists often understand the need for closely spaced lines with data collected with a very small station spacing. Thus, heavily wooded areas or rough terrain may make it difficult to collect good GPR data. With this in mind, how can I help you? Would the GPR be able to locate rebar in a foundation wall? A ground penetrating radar survey conducted with a 1000 MHz antenna over a solid poured concrete wall should respond the same as if it were a poured concrete floor. Problems start to occur when there are numerous voids spaces and the rebar, or other metal,is located back in the void space. For example, conduit placed in a thin concrete slab poured on top of a press stressed concrete slab generally responds as expected. However, if the conduit is fastened along the bottom of the slab it may not be detected. The problem is that the radar signal bounces around inside the large void spaces. Per our telephone conversation, you are interested in scanning concrete with GPR on a large scale. While many projects can be scanned using Sensors & Software’s Conquest, it is an integrated system designed to scan limited sized areas. If you plan on scanning larger areas or want greater control over how the results are viewed, you may want to consider S&S 1000 MHz Noggin or Pulse Ekko Pro based systems. These systems are less limited and can utilize other antennas for non-concrete applications (50 MHz, 100 MHz, and 200 MHz). You should plan on giving yourself a couple of days to get started. You may want to consider training. The Conquest would be the easiest to get started on. Trying to locate a mass civil war grave. We want to confirm the potential that a mass grave exists in a size of approximately 10 X 14 feet. This grave, if confirmed, contains between 22-25 bodies, both Confederate and Union. The location is grassy and contains no brush or trees. Our plans on marking this grave site with a granite monument containing the names of both Confederate and Union soldiers killed during the battle. Thank you for returning my call so promptly this morning. As discussed, I am interested helping you out and would plan on utilizing multiple technologies. Given the size of your target, I think this would make a good case history. The technologies I would include are electromagnetic terrain conductivity measurements with an EM-31 and EM38, magnetic measurements with a cesium vapor magnetometer, ground penetrating radar with 50, 100, and 200 MHz antennas, capacitance coupled resistivity with an OhmMapper, and a multi-electrode resistivity with an 84 electrode 8 channel SuperSting system. Please keep me informed on how your group proceeds. I am looking to find covered plastic curtain drain piping. While ground penetrating radar GPR (see Sensor’s & Software Noggin 250 Smartcart or Pulse Ekko Pro PEPRO 100 and 200 Mhz Smartcart systems) can detect and delineate drain tile systems, success is strongly dependent on soil conditions and depth. There are a couple of good papers on this. From my experience, the deeper the tile the less confident I would be detecting the tile. Assuming the soils allow you to have good penetration with the GPR signal, the tile can be more visible in the GPR record if a rodding tool, like a 1/2 inch flexible spring, is inserted into the tile. In some cases, it may be easier to detect the trench then the tile, for example, a trench dug in clay rich soils and then back filled with gravel. Also, there are cases where one could locate a tile with GPR at one end of a property and the same tile could not be located 100 feet away. This could easily be a case where the soils became more electrically conductive, which reduces the depth of penetration. I want to use ground penetrating radar to locate a 3 to 5 foot wide object that is between 3 and 10 feet deep. What type of soils do you have in the ground penetrating radar survey area? Is there an issue with any nearby metal? Is there a shallow water table? How can I help you? Thanks for the quick reply…Soil could be sandy, rocky or clay type, there shouldn’t be any issues with nearby metal and water table shouldn’t be shallow based on desired needs. I’m interested in renting GPR if possible and would appreciate any and all information pertinent to my interest as well as pricing. I would expect the GPR to work the best for you in areas with sandy soil and without water and metal. Electrically conductive clay rich soils can often lead to undesirable results. See gpr-suitability-map for a soils map showing where GPR may or may not work. A high concentration of larger rocks could possibly cause two problems. Depending on what you are trying to detect and which GPR antenna you use, rocks could scatter your signal and make it difficult for you to geophysically map your target. If the rocks are at the surface you may have a hard time acquiring the GPR data. If you want me to call you please email me a telephone number. I am trying to find some equipment that I can rent to find individual stones or wood stakes that were buried a long time ago. The soil around the stones/stakes is going to be sandy, and there should not be a lot of other items in the vicinity. Would one of your units work for this? Sensors & Software Noggin or pulseEKKO PRO system has interchangeable antennas and can be setup as a SmartCart. Additional antennas (100 MHz or 200 MHz) on the pulseEkko PRO cost very little. This way you would be able to try more than one frequency and find out what works best for you. You may want to consider, depending on how much space you have and other site conditions, testing the equipment over a known monument or burry your own marker in nearby soils so you can observe the response. Can somebody tell me if I can use GPR to find very old wood or stone survey markers. What model of GPR to be used and in what frequency is recommended. GPR may work. What else can you tell me. I would like to see a GPR demonstration to locate utilities in Chicago that are buried approximately 3 to 10 ft deep. Lets see what we can do. You may have mixed feelings about how well it works. Correct me if I am wrong, but Chicago has a lot of electrically conductive clay soils and fill material, some from the Chicago fire. This is a case where you may want to use ground penetrating radar for locating shallower utilities that you know where they start and end. Also, lower frequency GPR antennas are of little use over concrete with reenforcing material. If you can find areas with low conductivity soil you will likely get better penetration. If you want to test the soil first, I know where you can find an electrical resistivity meter that measures soil resistivities. I need to rent GPR equipment to locate cut off cable ends. The 3 to 6 inch diameter cables are buried 3 to 10 feet deep. It looks like your target size and depths are reasonable; however, the soils are very important. any metal or other cultural interference that may interfere with your survey? I am working in Florida working on “Telephone Cable Mining” project. The soils are typically sand and there are numerous other utilities nearby. (active telco, CATV, water lines,etc.) The water table is pretty shallow 2-3’ and we are looking for cut off cable ends buried near existing telephone closures. As we discussed on the telephone, it is interesting how the abandoned cables are left in place except for the more or less 20 ft section that is removed near the closures. I am here to help find a solution for locating those cut off cable ends and adjacent utilities. It sounds like a great project with a real problem that needs a solution, especially if you can image the cable you want to mine by identifying where the cable was removed. If you need a ground penetrating radar demonstration or some type of training we should be able to work something out. Joe, it is tough to say how deep the ground penetrating radar will penetrate. Loam is a soil that can vary in clay and moisture. The dryer the soil or loam, the deeper the GPR will likely penetrate. While a Sensors & Software Noggin 250 MHz antenna may penetrate deeper than a Noggin 500 MHz antenna, it may not have the resolution you need to locate old artifacts. I would suspect the diameters of the old artifacts, which are not expected to be long linear metal objects, may need to be measured in feet for a Noggin 250 MHz antenna to detect what you are looking for. If the artifacts are smaller than a foot in diameter you may want to consider a Noggin 500 MHz antenna. There is some overlap here and objects that are much much smaller than a foot in diameter may not be observed in the GPR record, unless you use a Noggin or Conquest 1000 MHz antenna. Another problem is whether or not there is a large enough electrical contrast between the soils and the old artifacts for the GPR signal to bounce off of and return to the surface. If you have past experience with the site and know the Noggin 250 MHz performs well for you, then you likely figured out what you want use. If not, you may want to do some GPR tests or other geophysical tests over known conditions at the site. If the artifacts are made of metal you may want to consider using a Geonics EM31 (for large items), an EM38 (shallower smaller objects), an EM61, or a Geometrics G856 or G858 magnetometer (for iron). I am looking for information about using ground penetrating radar to locate 3 to 6 inch diameter underground utilities at a depth of 1 to 3 feet. Greg, it looks like your target size and depths are reasonable; however, the soils are very important. Can you tell me what type of soils you have and how much water is present. Also, do you have any metal or other cultural interference that may interfere with your survey? Soil type is clay / back fill / topsoil. Should not be any metal that I am aware of, unless the pipe lays under the driveway; which may contain rebar reinforcing. Greg, electrically conductive water, back fill, soil, clays, and metal can be a real problem for ground penetrating radar. First of all, non-metallic utilities are often more difficult to locate with GPR, then utilities constructed with metal. Second of all, metallic underground utilities need to increase in size with the depth of burial. If the soil above the metallic underground utilities is electrically conductive or there is an electrically conductive layer above a metal underground pipe, cable, conduit, or other metal underground utility you may not observe a response in the GPR record. This is a case where you may want to try a more conventional underground utility line locator, by hooking on to the utility of concern or by inducing a signal on to the line. Depending on the situation and what you are looking for other geophysical equipment like Geonics’ EM31, EM61, or EM38 or a Geometrics G856 or G858 magnetometer may also work well. If you have a larger utility locating project and are looking to use GPR, you maybe able to improve your confidence that GPR will work by renting a Biddle, Megger, or AGI Super Sting or Swift earth resistivity meter or an electromagnetic terrain conductivity meter (e.g., Geonics EM31 or EM38). These geophysical instruments are often less expensive and can assist with determining if the soils have a low enough soil conductivity or high enough earth resistivity for the GPR signal to penetrate down to the utilities. While more detailed mathematical solutions are preferred, Sensors & Software offers a rule of thumb that approximates the depth of penetration (meters), a guesstimate, as 35 divided by the conductivity in mS/m. Thus, a homogeneous 17.5 mS/m soil unit could possibly penetrate approximately 2 meters. From an engineering geophysics standpoint, it is likely best to test several frequencies over known conditions to determine what works best for you, if anything. Sure sounds like GPR would not be a good fit for this application. Thanks for all your input and time. We have a 12″ 20′ culvert under a roadway in front of our office here in Texas. It is about 12″ below the surface and is covered by slag from a local steel mill. Although the surface material is slightly magnetic the anamoly from the culvert is so large it is easily detected by all of the instruments mentioned. While any of the instruments might work I agree that under the conditions you mentioned a magnetometer is probably the best choice. I’m wanting to locate a buried culvert that is in a wet swampy area of road way. Will the radar penitrate the roadway to determine its location under the wet conditions? David, ground penetrating radar does not do well in wet conditions, unless the water is electrically resistive. Also, clay soils are a problem for GPR. GPR does well in dry sand and gravel, on top of bedrock, and even over ice (ice is typically electrically resistive). GPR may work if the culvert is in contact with the pavement or immediately below with some gravel on top of it. If the pavement is made of concrete with reenforcing material, there is likely a greater problem. A lower frequency antenna designed to penetrate into the soil will not likely work with closely spaced rebar or wire mesh. The GPR signal is reflected off of the metal in the pavement. A higher frequency antenna often allows the GPR signal to pass between the reenforcing bar or wire mesh but can not penetrate into the water or electrically conductive soil. Thus, the gpr signal does not reach the culvert. This is a situation where other geophysical instruments, like Geonics’ EM31, Geonics’ EM61, or a Geometrics’ magnetometer, would likely yield desirable results. These instruments can not provide the detail ground penetrating radar can provide but they are very sensitive to buried metal and often cost much less to rent. If the pavement has metal in it the Geonics instruments will not work. A Geometerics magnetometer G858 or a G856 would likely get you close to the culvert, if the culvert is made of iron, has enough size and mass to detect, and there is not a lot of other iron objects around. The magnetometer would need to be elevated to assist with minimizing the response from iron within the pavement. Ground penetrating radar has some of the best resolution of all the geophysical methods. In my opinion, it is unlikely GPR will locate a 1 inch diameter non-metallic target at a depth of 3 feet. However, a 3 inch diameter target at 12 inches or less is far more likely, depending on the soil conditions. Another problem GPR may have involves false positives. That is, are there many other objects that are about the same size and shape as the artifacts you are looking for? What type of soils do you have (sand, gravel, clay, etc.)? Is the area covered with concrete? Is there much water in the survey area? Where Does Ground Penetrating Radar Work?